This review is significantly revamped from its original version. The developer of this game, Jameson Wilkins, is a hero. When I first played ANoW, I was impressed with the artwork and game concept but deeply disappointed with the controls and pacing, leaving me frustrated and wanting more. Apparently, Jameson took my suggestions to heart and with several changes in the reviewed update (beta 1.3) virtually all of my complaints have been addressed; now, I think I'm hooked. ANoW has completely transformed, and if you played an earlier version and put it down, make absolutely certain to give it a second chance. 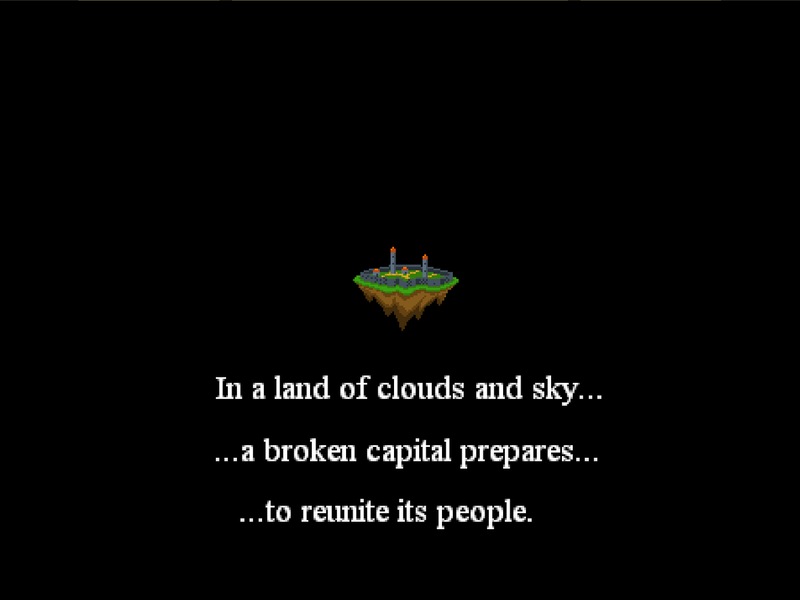 I can safely say that A Nation of Wind is one of the most interesting game concepts I've gotten a chance to play lately. An ambitious blend of real time strategy ala Populous and what the developer calls "arena shooter" elements, ANoW is a unique combination indeed. Players are tasked with piloting an airship around a series of floating islands, building structures to generate resources, slaying bizarre creatures out to spoil your airborne party, and eventually winning the favor of the gods by claiming obelisks. (You do this by building temples around them. It all makes sense once you fall in the groove.) The creator of this novel concept is Jameson Wilkins - a freelance video game artist who has worked on iOS projects and browser based games, and clearly has a love for 90's style pixel art. Upon launching ANoW, I was immediately smitten with the gorgeous graphics, animated menus and general personality and charm. 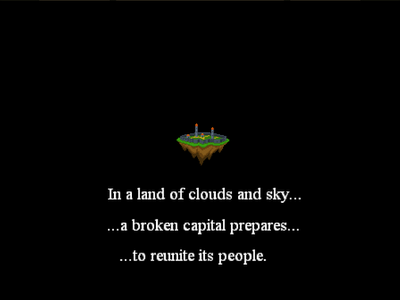 Graphically, this game has it down, and Mr. Wilkins should be proud. 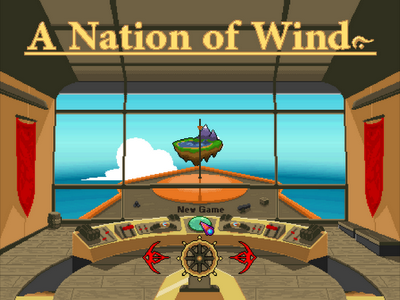 A Nation of Wind is beautiful. 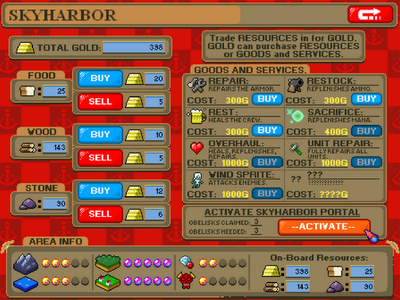 Gameplay begins with a short tutorial that gives you the basics of weapon usage, ship control and structure building. The controls in the game have been significantly improved since the earlier versions. Controlling the ship through the standard AWSD keyboard interface and firing your weapons with the mouse-driven target reticle is smooth and effective. Pilots can switch between combat, build, and magic modes with Q and E, a simple but genius system that can be mastered relatively quickly. 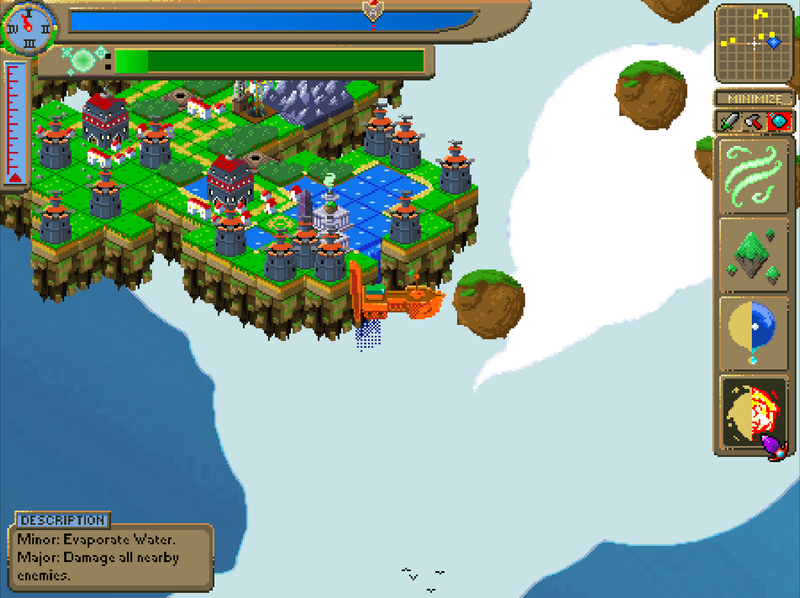 The slow, cumbersome movement of the ship in the earlier versions has been corrected as well and floating around your island realm creating and defending your empire is much more pleasurable now. 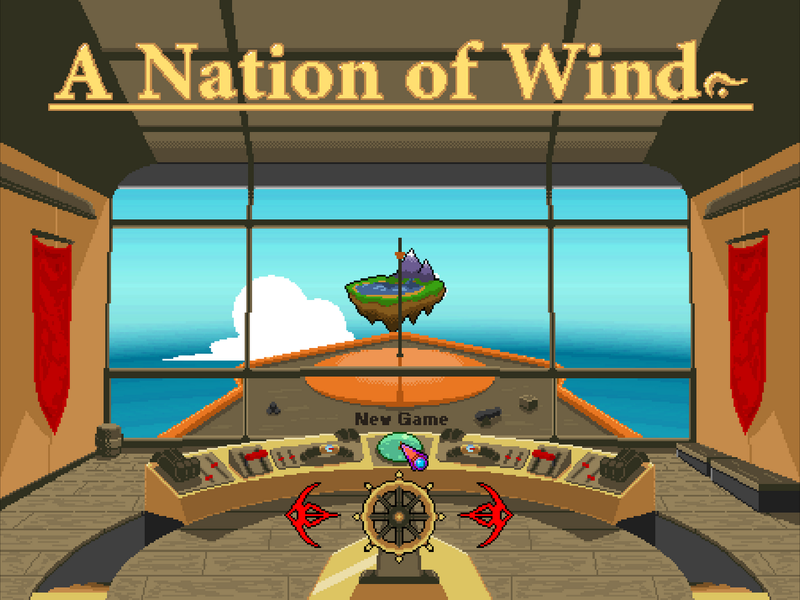 Building structures throughout the randomly generated islands in order to produce resources, with which you can eventually (of course) build more structures, is one of the main elements of A Nation of Wind. Placing these buildings is as simple as selecting it in the build menu and plopping it down, assuming of course that the requisite resources to craft it are in stock. Placing a mine by rock deposits produces stone, creating fields then placing a farm in the middle produces food and so on. 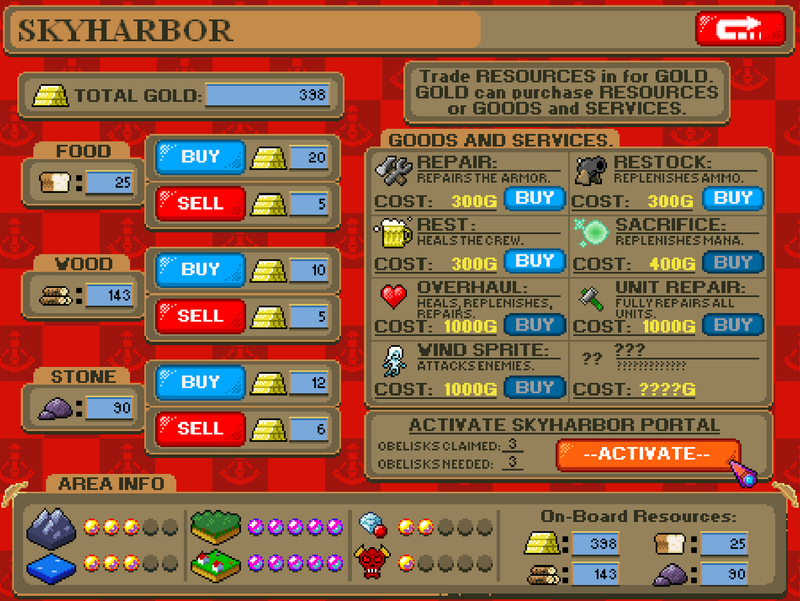 You start with a small amount of resources in your stock, allowing you to craft some basic buildings in order to grow and prosper. Time progresses in ANoW and is measured by days, after which the aforementioned buildings poop out magic balloons of resources. Rather than being deposited automatically into your stockpile, you have to putt around the map each day and collect these balloons, a process I found tedious and annoying in the first version of the game I played. Jameson has significantly tweaked not only the speed and agility of your airship (as I mentioned before) but has also adjusted the pacing of the days as well as the speed of resource gathering. Now, this element of the experience feels natural rather than tacked on, and can simply be integrated with making the rounds repairing your buildings and checking up on things. While all of this is going on, various creatures are on the loose, probably wreaking havok on the aforementioned buildings. Of course, you have to kill them, all the while building more structures to generate the resources you need to capture obelisks and progress further. 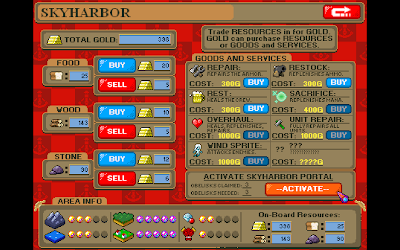 Fortunately for you, your wooden galleon possesses multiple methods of destruction: a minigun with unlimited ammo (that overheats), a side-firing cannon, a front firing harpoon that can be aimed with the mouse and a rear-firing mine. Sometimes, I found myself dumping out a mine when I didn't mean to, but after playing for a while I got the hang of the location-aware weapon system (where you have your target reticle positioned affects what weapon is released). 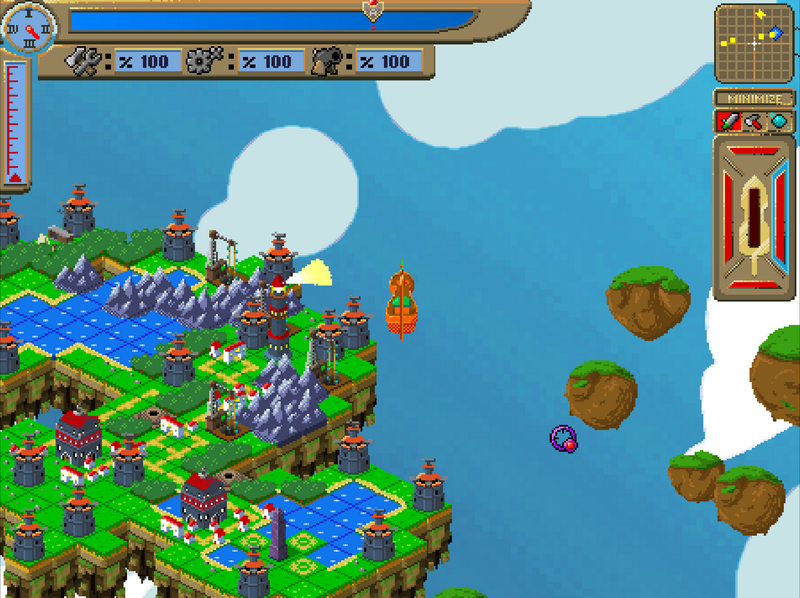 After building up your resources, players have to capture obelisks scattered about the world, and this is done by placing temples, which generate mana. (Yes, there is a lot going on in this game.) You can use this mana to cast devastating and helpful spells, used to heal your units, bend the terrain to your will, or destroy enemies. You'll need these spells once you capture the requisite quantity of obelisks necessary to claim the world as your own. Once you activate the portal at your harbor (the home base of sorts) a monstrous baddie will emerge. Plinking away at it with your pea-shooter minigun won't help - you'll need the power of the gods to decimate these guys. 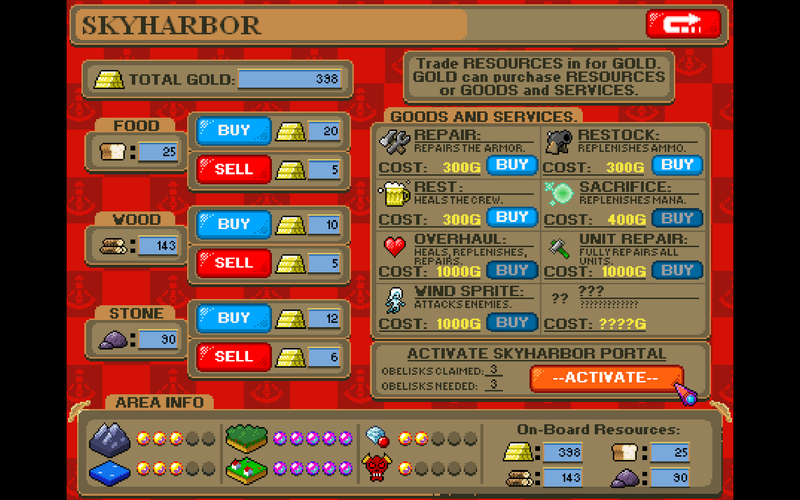 After defeating the area boss and returning to the main screen, you're given the option to upgrade elements of your units and airship in order to conquer additional islands, using the experience you earned as currency. Overall, I'm happy to declare that I love A Nation of Wind in its current form. It's amazing how some simple tweaks to pacing and gameplay can completely transform a game experience from frustrating to fantastic. I heartily encourage all gamers to give this one a spin - the mix of beautiful art and manic, addictive, strategic gameplay make ANoW one to remember. Download the game here (from the official development blog). This game is great. I couldn't recommend it for everyone, but for some people, it's going to be really big. And the music, particularly the theme song, is awesome.